Looking for a simple side dish to serve alongside your holiday turkey? 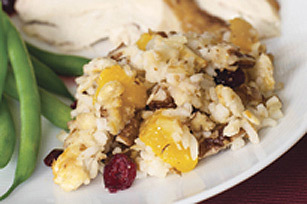 Our Peaches and Pecan Rice Stuffing fits the bill. Both sweet and savoury, this rice side dish has a little bit of something for everyone. Preheat oven to 350°F. Combine rice, crushed crackers, peaches, pecans and cranberries in large bowl; mix well. Add dressing; toss well to coat. Spoon into large casserole dish; cover tightly with foil. Bake 30 min. Serve hot. To prepare with turkey, mix all ingredients in large bowl until well blended. Stuff turkey lightly with rice mixture. Truss turkey; place in large roasting pan and bake. Cook any remaining rice mixture as directed in recipe. Look for more turkey directions in Turkey 101 on kraftcanada.com. Turkey is done when internal temperature of thighs register 180°F and when juices run clear when pricked with fork. Remove turkey from oven. Place cooked turkey on cutting board resting on flat aluminum tray to catch running juices. Tent cooked turkey with foil. Let stand 15 min. before carving.